Paula on the outlook for . 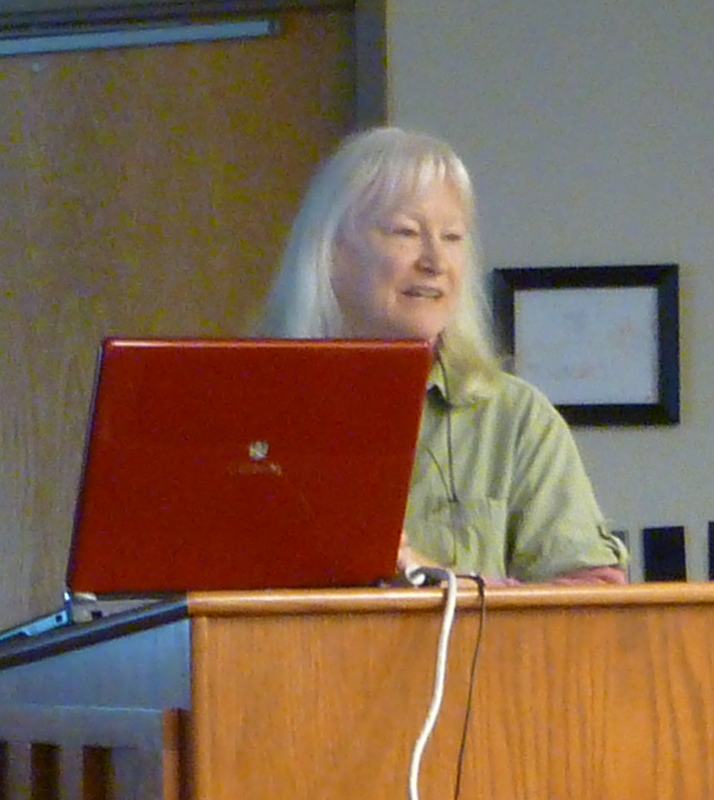 . .
Karen Lawrence discusses bird photography at home and in the field. Join your friends–and make new ones–as Paula Gorgoglione and Karen Lawrence lead walks along the Greenway. Walks are sponsored by the Franklin Bird Club. Call 524-5234 with any questions. For the last 2 years, as you know, we’ve had weekly walks on the Greenway. It’s a beautiful location with diverse habitats for birds, and we’ve had some wonderful sightings. To date we’ve seen 123 different species. (List attached.) The Greenway is one of Franklin’s treasures and deserves all our support. * Friends of the Greenway, Inc. is a 501 (c) (3) non-profit organization. There are 2 paid employees who work at FROG Quarters running the coffee/gift shop–one works part-time and is grant funded from a Federal program for seniors and one works part-time at minimum wage paid from Friends of the Greenway budget. Note that lack of volunteers contributed to the need to pay from budgeted funds. Thanks–your support will be appreciated. Our last bird walk on the Greenway for this year brought out ten loyal participants and we found 38 species, great for end of October. Paula was there too along with Ned, Jean, Ellen, Jim, Pat, Rita, David, and Barbara. We had good weather and a fine day for birding. Our list: Canada Geese, Turkey Vultures (lots) Cooper’s Hawk, Red-tailed Hawk, Mourning Dove, Belted Kingfisher, Red-bellied WP, Downy WP, Northern Flicker, Pileated WP, Eastern Phoebe, Blue-headed Vireo, Blue Jay, American Crow, Tufted Titmouse, Carolina Chickadee, White-breasted Nuthatch, Carolina Wren, House Wren, Golden-crowned Kinglet (Yea! ), Eastern Bluebird, American Robin, Gray Catbird, Northern Mockingbird, Brown Thrasher, European Starling, Cedar Waxwing, Yellow-rumped Warbler, Common Yellowthroat, Northern Cardinal, Eastern Towhee, Field Sparrow, Chipping Sparrow, White-throated Sparrow, Song Sparrow, Swamp Sparrow, Red-winged Blackbird, and American Goldfinch. Let’s all help make the Christmas Bird Count a special and fun event on January 4th!! Our walk on Wed., Oct. 23, was rather chilly but we (Pat, Ned, David, Jim, Ellen, and I) managed to see/hear 39 species!!! When I first arrived i found the Doubled-crested Cormorant fishing around on the north side of the Tassee Bridge. Then 2 Mallards flew in followed by about 60+ Canada Geese that kept flying over. The other 36 species were: Turkey Vultures, Black Vulture, Red-shouldered Hawk, Red-tailed Hawk, Mourning Doves, Rock Pigeons, Belted Kingfisher, Red-bellied and Downy Wdps., N. Flicker, Yellow-bellied Sapsucker, Pileated Wdp., E.Phoebe, Blue Jays, Am.Crows, Tufted Titmice, C. Chickadees, White-breasted Nuthatch, Carolina Wrens, House Wren, E.Bluebirds, Am.Robins, Gray Catbird, N.Mockingbirds, Eur.Starlings, Cedar Waxwings, Yellow-rumped Warblers, Palm Warbler, N.Cardinals, E.Towhees, Field Sparrow, White-throated Sparrows, Song Sparrows, Common Grackles, House Finches, and Am. Goldfinches. Next Wed. is our FINAL walk of the season so meet us at 8:00 at the Library–don’t miss it!!!!!!!!! Pileated WP, Eastern Phoebe, Blue Jay, American Crow, Fish Crow, Tufted Titmouse, Carolina Chickadee, White-breasted Nuthatch, Carolina Wren, Blue-gray Gnatcatcher, Eastern Bluebird, American Robin, Gray Catbird, Northern Mockingbird, Cedar Waxwing, Northern Cardinal, Indigo Bunting, Eastern Towhee, Field Sparrow, Chipping Sparrow, Savannah Sparrow, Song Sparrow, Red-winged Blackbird, House Finch, and American Goldfinch for a total of 33. Only Two more walks!!! Come join Paula next Wednesday at Salalie, and then Karen at the library for the last walk of the year on Oct. 30. I need to make an addition to the species list for our walk on Oct. 9–I forgot to add the Bay-breasted Warbler. How could I overlook that one??!!?? Our walk on Wed., Oct. 9, was in a LOT of fog but we worked “hard” to identify 46 species. Jean, Diane, Jim, Ellen, and I welcomed 4 new birders–Ann, Judy and Tom, and Chris–and we hope that we will see them again on our walks. The birds that we saw/heard were the following: Pied-billed Grebe, Mallards, Canada Geese, Turkey Vulture, Cooper’s Hawk, Mourning Doves, Rock Pigeons, Red-bellied and Downy Wdp., Yellow-bellied Sapsucker, N.Flicker, PIleated Wdp.,E.Wood Pewee, E.Phoebes, White-eyed Vireo, Blue Jays, Am.Crows, Fish Crow, Tufted Titmice, C.Chickadees, White-breasted Nuthatch, C.Wrens, E.Bluebirds, Am.Robins, Gray Catbirds, N.Mockingbirds, Brown Thrashers, Eur.Starlings, Cedar Waxwings, N.Parula, Chestnut-sided Warbler, Magnolia Warbler, Blackburnian Warbler, Yellow-rumped Warblers, Black-throated Green Warbler, Palm Warbler, Yellow-throated Warbler, N.Cardinals, Rose-breasted Grosbeak, Indigo Buntings, E.Towhees, Song Sparrows, Red-winged Blackbird, House Finches, and American Goldfinches. We have only THREE GREENWAY WALKS left for this year–so please join Karen next Wednesday at the Library!!! We birded in a fog all morning so we saw lots of bird silhouettes. Nat, David, Don, Jim and Ellen, Diane and Karen worked at identifying what we heard and saw and came up with 36 species: Turkey Vulture, Red-tailed Hawk, Mourning Dove, Chimney Swift, Red-bellied WP, Downy WP, Northern Flicker, Pileated WP, Eastern Wood-pewee, Eastern Phoebe, White-eyed Vireo, Blue Jay, American Crow, Tufted Titmouse, Carolina Chickadee, White-breasted Nuthatch, Carolina Wren, Eastern Bluebird, American Robin, Gray Catbird, Northern Mockingbird, Brown Thrasher, Cedar Waxwing, Tennessee Warbler, Magnolia Warbler, Black-throated Green Warbler, Palm Warbler, American Redstart, Northern Cardinal, Rose-breasted Grosbeak, Indigo Bunting, Eastern Towhee, Field Sparrow, Song Sparrow, Red-winged Blackbird, House Finch. Come join us to find the migrating birds in our last month of bird walks this year. Paula will be at Salali next Wednesday at 8:00 am. Our bird walk on Wed., Sept. 25, was officially RAINED OUT but I went there just in case anyone did show up. After awhile the rain slowed enough that I was able to walk a bit and then it actually stopped raining for about 30 minutes. I was able to count 23 species: An immature Red-tailed Hawk, Mourning Dove, Rock Pigeons, Red-bellied Woodpeckers, Downy Woodpeckers, Pileated Wdp., White-eyed Vireos, Blue Jays, Am. Crows, Fish Crow, Carolina Chickadee, Carolina Wrens, Am. Robins, Gray Catbirds, N.Mockingbirds, Brown Thrashers, Eur.Starlings, Tennessee Warbler, Black-throated Green Warbler, N.Cardinals, E.Towhees, Song Sparrow, and Am.Goldfinches. Hopefully next Wednesday will bring us some much better weather!!! Karen was out of town on Sept 18, but we were able to enjoy a great morning of birding despite her absence. Our group consisted of Jim, Ellen, Mike (soon to be leaving), David, David’s sister Marsha, Ned, Lois, and Jean B. We saw/heard a total of 40 species: Canada Goose, Mourning Dove, Rock Pigeon, Chimney Swift, Ruby-throated Hummingbird, Red-bellied Woodpecker, Pileated W, Eastern Wood-pewee, Eastern Phoebe, Blue Jay, American Crow, Tufted Titmouse, Carolina Chickadee, Carolina Wren, House Wren, Blue-gray Gnatcatcher, Eastern Bluebird, American Robin, Gray Catbird, Northern Mockingbird, Brown Thrasher, European Starling, Cedar Waxwing, Northern Parula, Tennessee Warbler, Chestnut-sided W, Magnolia W, Caper May W, Black-throated Green W, Palm W, Yellow-throated W, American Redstart, Scarlet Tanager, Northern Cardinal, Rose-breasted Grosbeak, Indigo Bunting, Eastern Towhee, Field Sparrow, House Finch, and American Goldfinch. Fall migration is definitely underway! On Wed., Sept.11,2013, I was joined by Brock Hutchins and Don Shure from the Highlands Audubon Society as well as Mike and Mary Lou, Jim and Ellen, Don F., Ned, David, Jean, Barbara, and Diane…..and what a morning of birds we had!!!! Of greatest surprise–Barbara spotted a member of the Nightjars resting on a limb above us. We tried hard but we could not come to a definite conclusion as to whether it was a Whip-poor-will or a Chuck-will’s-widow. If it would have only “spoken” to us!!! In addition to the Nightjar we saw/heard 48 others: Canada geese, Wood Ducks, Turkey Vultures, Red-shouldered Hawk, Red-tailed Hawk, Killdeer, Mourning Doves, Rock Pigeons, Chimney Swift, Ruby-throated Hummingbirds, Belted Kingfisher, Red-bellied and Downy Wdps., N.Flickers, E.Wood Pewee, E.Phoebes, Great-crested Flycatcher, E.Kingbird, White-eyed Vireos, Blue Jays, Am.Crows, Fish Crow, Tufted Titmice, Carolina Chickadees, White-breasted Nuthatch, Carolina Wrens, House Wrens, Blue-gray Gnatcatchers, E.Bluebirds, Am.Robins, Gray Catbirds, N.Mockingbirds, Brown Thrashers, Eur.Starlings, Cedar Waxwings, N.Parulas, Tennessee Warblers, Chestnut-sided Warblers, Magnolia Warblers, Yellow-throated Warblers, Am.Redstarts, Scarlet Tanager, N.Cardinals, Indigo Buntings, E.Towhees, Song Sparrows, House Finches and Am.Goldfinches. Wow–thanks to all who came!!! And we hope to see all of you NEXT WED. at the Library section of the Greenway! Pat N., Jim and Ellen, Jean, Rita, Bob, and Karen began today’s birding experience in the fog and it did not burn off until 11:30 when we completed our walk. Thus, a cool morning and lots of silhouettes, however the birds were there! We found 48 species and lots of activity and movement of birds with lots of chirps and cheeps. Our most exciting was hearing and seeing an Osprey fly down the river!! Then there were the warblers, obviously on the move with another sighting of the Golden-winged Warbler. Others seen/heard were: Turkey Vulture, Red-tailed Hawk, Mourning Dove, Chimney Swift, Ruby-throated Hummingbird, Red-bellied WP, Downy W., Pileated WP, Eastern Wood-pewee, Eastern Phoebe, White-eyed Vireo, Blue Jay, American Crow, Barn Swallow, Tufted Titmouse, Carolina Chickadee, White-breasted Nuthatch, Carolina Wren, House Wren, Ruby-crowned Kinglet, Blue-gray Gnatcatcher, Eastern Bluebird, American Robin, Gray Catbird, Northern Mockingbird, Brown Thrasher, E. Starling, Cedar Waxwing, Northern Parula, Tennessee Warbler, Chestnut-sided W., Magnolia W., Blackburnian W., Black-throated W., Yellow-throated W., American Redstart, Hooded W., Scarlet Tanager, N. Cardinal, Indigo Bunting, Eastern Towhee, Field Sparrow, Song Sparrow, Red-winged Blackbird, Orchard Oriole, and American Goldfinch. Yipee!! Let’s join the Shelton’s this Saturday for another birding adventure, and then Paula’s next Wednesday walk at Sahalie Lane. On Saturday, Aug.31, our Franklin Bird Club and the Highlands Audubon Society teamed up at the Library section of the Greenway. In contrast to our last Wednesday walk the birds were overall on the “quiet” side. However the 12 of us scoured every tree, bush and field as well as the skies above to find a total of 36 species. We were especially excited to see 2 Double-crested Cormorants flying overhead and the other 35 species were the following: Turkey Vultures, Mourning Doves, Ruby-throated Hummingbirds, Red-bellied Wdps., Downy Wdps., Hairy Wdp., N.Flicker, Pileated Wdps., E.Phoebes, White-eyed Vireo, Blue Jays, Am.Crows, Tufted Titmice, Carolina Chickadees, White-breasted Nuthatch, Carolina Wrens, House Wren, Blue-gray Gnatcatchers, “millions” of E.Bluebirds, Am.Robins, Gray Catbirds, N.Mockingbirds, Brown Thrasher, Cedar Waxwings, N.Parulas, Black-throated Green warbler, Black and White Warbler, Scarlet Tanager, N.Cardinal, Field Sparrows, Song Sparrow, Common Grackle, Baltimore Oriole(female), House Finches, and Am. Goldfinches. Thanks to all who came–and please join Karen at the Library section next Wed.
Our weekly Greenway walk on Aug. 28, was spectacular!!! I was joined by 7 others–Mike, Jean, Bob, Rita, Diane, Ellen and Jim–and we found 50 species. From the very start the trees came alive with a mix of warblers and other birds. Before we left Salali Lane and the parking area we already had 39 species–and right as we crossed the Tassee Bridge we found a Double-crested Cormorant perched on a log over the river. Then we found another mixed group of warblers and among them was the Golden-winged warbler. The other 48 species were the following: Canada Geese, Turkey Vulture, Broad-winged Hawk, Killdeer, Mourning Doves, Rock Pigeons, Ruby-throated Hummingbirds, Belted Kingfisher, Red-bellied Wdp, Downy Wdp., E.Wood Pewees, E.Phoebe, E.Kingbird, Red-eyed Vireo, Blue Jays, Am.Crows, Fish Crows, Barn Swallows, Tufted Titmice, Carolina Chickadees, White-breasted Nuthatches, Carolina Wrens, House Wrens, Blue-gray Gnatcatchers, E.Bluebirds, Am.Robins, Gray Catbirds, N.Mockingbirds, Brown Thrashers, Eur.Starlings, Cedar Waxwings, N. Parulas, Tennessee Warbler, Chestnut-sided Warblers, Blackburnian Warbler, Black-throated Green Warblers, Yellow-throated Warblers, Am.Redstarts, Hooded Warblers, Yellow-breasted Chat, Scarlet Tanager, N.Cardinals, Rose-breasted Grosbeaks, Indigo Buntings, E.Towhees, Song Sparrows, House Finches, and Am. Goldfinches. Please consider joining our Saturday walk on Aug. 31 at the Library where we will be birding along with the Highlands Audubon Society starting at 8:00am. And don’t forget Karen’s walk next Wednesday! We just barely got in our bird walk this morning before the rain came. It started out very quiet and ominous but eventually the birds showed and 13 people were there to help find the birds. Thanks to Mike (soon to leave us), Ned, Ellen and Jim, Diane, George, Corinn and David (welcome! ), and Don and Sandy with friends Selma and Jeanette. What a great group of birders and we found 29 before the rains sent us home. Great Blue Heron, Mourning Dove, Ruby-throated Hummingbird, Belted Kingfisher, Red-bellied Woodpecker, Downy WP, Northern Flicker, Eastern Phoebe, Eastern Kingbird, White-eyed Vireo, Blue Jay, American Crow, Tufted Titmouse, Carolina Chicadee, White-breasted Nuthatch, Carolina Wren, House Wren, Blue-gray Gnatcatcher, Eastern Bluebird, Gray Catbird, Northern Mockingbird, European Starling, Cedar Waxwing, Northern Cardinal, Indigo Bunting, Eastern Towhee, Field Sparrow, Orchard Oriole, and American Goldfinch. Let’s join Paula at Salalie Lane next Wednesday for more birding! It was a really pleasant morning for our birdwalk on Aug. 14 and we were able to identify 48 species! The warblers are on the move–just have your Field Guides marked at the page for Confusing Fall Warblers. Among the warblers that we saw/heard were N. Parulas, Black-throated Greens, Palms, Am.Redstarts, Hooded, and a Yellow-breasted Chat…but there were some that “got away” before we could determine their ID. The other species were the following: Great Blue Heron, Canada Geese, 5 Mallards, Turkey Vultures, Coopers Hawk, Red-shouldered Hawk, Mourning Doves, Rock Pigeons, Chimney Swifts, a “million” Ruby-throated Hummingbirds, Red-bellied Wdp., Downy Wdp., N. Flicker, Pileated Wdp., E.Phoebes, E,Kingbirds, Red-eyed Vireos, White-eyed Vireos, Yellow-throated Vireos, Blue Jays, Am.Crows, Fish Crows, Barn Swallows, Tufted Titmice, Carolina Chickadees, White-breasted Nuthatches, Carolina Wrens, House Wren, Blue-gray Gnatcatchers, E.Bluebirds, Am.Robins, Gray Catbirds, N.Mockingbirds, Eur.Starlings, Cedar Waxwings, the warblers listed above, N.Cardinals, Indigo Buntings, E.Towhees, Field Sparrows, Song Sparrows, Orchard Orioles, and Am.Goldfinches. Thanks to those who joined me–Mike, Jim, Ellen, Ned, Barbara, Diane, and Rita–what a great team!!! Mike, Ned, Rita, and myself checked out the greenway from Big Bear seeing the adult and juvenile river otters as we first got there. Overcast and threatening we kept going and found the following: Great Egret, Green Heron, Turkey Vulture, Mourning Dove, Ruby-throated Hummingbirds, Belted Kingfisher, Red-bellied Woodpecker, White-eyed Vireo, Blue Jay, American Crow, Tree Swallow, Tufted Titmouse, Carolina Chicadee, Carolina Wren, Blue-gray Gnatcatcher, Gray Catbird, Northern Mockingbird, Brown Thrasher, Hooded Warbler, Northern Cardinal, Eastern Towhee, Song Sparrow, Field Sparrow, Red-winged Blackbird, Common Grackle, Orchard Oriole, and American Goldfinch. My walk will return to the library section of the Greenway next time, August 21st. Hope you join us! We had a very drippy, wet start to our Wednesday, July 31, bird walk on the Greenway. But even with rain spots on our binoculars/eyeglasses we ( Jim and Ellen, David, Louis, Jean, Mike, and 2 new birders–Loretta and Phil–and myself) tried to start our list. Just when we were headed to our cars having decided to call it off, we began to see warblers, including a Worm-eating Warbler and American Redstarts–and then the rain ceased!!! So we were able to continue on ending with a total of 40 species. In addition to the warblers already mentioned we saw/heard: a Great Blue Heron, Canada Geese, Mourning Doves, Rock Pigeons, Chimney Swifts, Ruby-throated Hummingbirds, Red-bellied Woodpeckers, Downy Wdp., N.Flicker, E.Phoebe, Great-crested Flycatcher, E.Kingbirds, White-eyed Vireo, Blue Jays, Am. Crows, Fish Crows, N.Rough-winged Swallows, Barn Swallows, Tufted Titmice, Carolina Chickadee, Carolina Wren, Blue-gray Gnatcatchers, E.Bluebirds, Am.Robins, Gray Catbirds, N.Mockingbirds, Brown Thrasher, Eur.Starlings, Cedar Waxwings, Yellow-throated Warbler, Black and White Warbler, N.Cardinals, Indigo Buntings, E.Towhees, Song Sparrows, Common Grackles, Orchard Orioles (about 5 females and 1 male), and Am. Goldfinches. With the sighting of the Worm-eating Warbler our total count of species seen on the Greenway is now up to 124. A beautiful morning on the Big Bear section walking to Suli Marsh and back. Jean, Ned and Rowann, Lois, Diane, Rita, Barbara, and myself started our walk with some non-bird excitement; River Otters and babies! We heard the babies squeaking first and then saw otters coming from across the river and going into the bank below us. Foliage is high on the banks now so they were hidden from us. Then the little swamp held a graceful Great Egret, Green Heron, Mallard begging for handouts, Downy Woodpecker, and a Great Blue Heron. After that great start we found: Mourning Doves, Ruby-throated Hummingbird, Eastern Phoebe, White-eyed Vireo, Blue Jay, American Crow, Tree Swallow, Tufted Titmouse, Carolina Wren, Blue-gray Gnatcatchers, American Robin, Gray Catbird, Northern Mockingbird, Brown Thrasher, European Starling, Cedar Waxwing, Northern Cardinal, Indigo Bunting, Eastern Towhee, Song Sparrow, Red-winged Blackbird, Orchard Oriole and offspring giving us quite a show, and American Goldfinches. A total of 29 species. We are going to return to the same walk in two weeks, August 7th….come join us. It is beautiful there with the lushness and who knows what we will find in the river and the swamps! Our walk on Wed., July 17, 2013, was under mostly cloudy skies but it was a great day for birding–and the sun did come out just as we were approaching the end. Mike, Lenny, Ned, Jim, Ellen, Rita, Diane, and a new birder–Jean Hayes– and myself saw/heard 41 species. They were the following: Turkey Vultures, Mourning Doves, Rock Pigeons, Chimney Swifts, many Ruby-throated Hummingbirds, Belted Kingfisher, Red-bellied Wdp., N.Flickers, Pileated Wdp., E.Phoebes, many E.Kingbirds, Red-eyed Vireo, White-eyed Vireos, Blue Jays, Am.Crows, Fish Crows, N.Rough-winged Swallows, Barn Swallows, Tufted Titmice, Carolina Chickadees, White-breasted Nuthatch, Carolina Wrens, Blue-gray Gnatcatchers (many of those too), Am.Robins, Gray Catbirds, N.Mockingbirds, Brown Thrashers, Eur.Starlings (too many of those), Cedar Waxwings, N. Parulas, Black-throated Green Warbler, Yellow-throated Warblers, Black and White Warbler, Yellow-breasted Chats, N.Cardinals, many Indigo Buntings, E.Towhees, Field Sparrows, Song Sparrows, Common Grackles, and Am.Goldfinches. Hope we’ll see you next Wed. for Karen’s walk at BIG BEAR! found 38 species on a clouded over morning including: Great Egret, Mallard, Turkey Vulture, Mourning Dove, Rock Pigeon, Chimney Swift, Ruby-throated Hummingbird, Belted Kingfisher, Downy Woodpecker, Northern Flicker, Eastern Phoebe, Eastern Kingbird, Blue Jay, American Crow, Fish Crow, Barn Swallow, Tufted Titmouse, Carolina Chickadee, Carolina Wren, Blue-gray Gnatcatcher, Eastern Bluebird, American Robin, Wood Thrush, Gray Catbird, Northern Mockingbird, Brown Thrasher, European Starling, Cedar Waxwing, Yellow-throated Warbler, Common Yellowthroat, Northern Cardinal, Indigo Bunting, eastern Towhee, Song Sparrow, Red-winged Blackbird, Common Grackle, House Finch, and American Goldfinch. Next Karen walk on July 24th we will start at Big Bear and walk towards Suli Marsh checking out the birds on that section of the Greenway. Come join us! Hey Paula – and we saw another one on our walk with Karen this morning on the Old Airport Trail – must be the season – beautiful!! Hi Pat, I was not at the Greenway but 3 Great Egrets did fly into a tree across from the back of my house on the west side of the town of Franklin and they perched there for a short time. This was at 8:20 this morning. They were problably part of the group that you saw. Welcome Stan and Mary – Beth’s friend Pat here. Just wanted to let you all know that I spotted a flock of 4-5 large white “egrets”?? flying over Sali as I was driving by (no time to stop). Anyone else seen them? Yes, we did have a “walk” on Wed., July 3, 2013!!! In spite of rain, rain, & rain I arrived at Salali Lane about 7:45 not thinking that anyone else would come. Fortunately the rain had stopped and I had wonderful sightings of the Yellow-throated Warblers and quite a few other birds. Then there was a carn horn and it was Mike–so the two of us continued in spite of on/off showers! Finally just past the Tassee Shelter it began to rain harder and we knew we had to turn around. But we were able to hear/see 27 species in that short time and through many raindrops–A Great Blue Heron in flight, Canada Geese, Mourning Doves, Rock Pigeons, Chimney Swifts, Red-bellied Wdp., N.Flicker, E.Phoebe, lots of E.Kingbirds, Blue Jays, Am.Crows, Fish Crows, N.Rough-winged Swallows, Tufted Titmice, Carolina Chickadees, White-breasted Nuthatch, Carolina Wrens, Am.Robins, Gray Catbirds, N.Mockingbirds, Brown Thrasher, Eur.Starlings, Yellow-throated Warblers, N. Cardinals, Indigo Buntings, E. Towhees, Song Sparrows. Hopefully next Wednesday will bring a little brighter day for our next bird walk with Karen! Many thanks to the HIghlands Audubon Society members as well as to all who came to our joint birdwalk on Saturday, June 29. There were 18 of us and we were able to hear/see 44 species which were the following: Great Egret, Turkey Vultures, A WILD TURKEY, Mourning Doves, Rock Pigeon, Chimney Swifts, Ruby-throated Hummingbird, Red-bellied Wdp., Downy Wdp., Hairy Wdp., Pileated Wdp., E.Phoebe, Great-crested Flycatcher, Red-eyed Vireo, White-eyed Vireo, Blue Jays, Am.Crows, N.Rough-winged Swallows, Barn Swallows, Cliff Swallows, Tufted Titmice, Carolina Chickadees, White-breasted Nuthatches, Carolina Wrens, Blue-gray Gnatcatchers, E.Bluebirds, Am.Robins, Gray Catbird, N.Mockingbirds, Cedar Waxwings, N.Parula, Black and White Warbler, Yellow-breasted Chats, Scarlet Tanager, N.Cardinals, Indigo Buntings, Blue Grosbeaks, E.Towhees, Field Sparrows, Song Sparrows, Brown-headed Cowbirds, Red-winged Blackbird, House Finches, and Am. Goldfinches. The finding of the Wild Turkey by Brock has now added one more species to our 3-year Bird Club Greenway list–now we are at 123 species seen on the Greenway. Our next walk will be tomorrow–Wed, July 3–starting at Salali Lane. Hope to see you there!!!! Ten of us started at Old Airport Trail on the Greenway behind The Friends of the Library store and had a very good morning of bird watching. We witnessed a phenomenon of nature watching an Orchard Oriole female feed two baby Brown-headed Cowbirds! Later we saw a pair of Brown-headed Cowbirds. Another great sighting was of a Great Egret flying over the Greenway. We also got a brief viewing of a Green Heron. The pond along that section that is behind the car wash on Highlands road attracted a lot of species and is also where we saw the Oriole. We also saw several Willow Flycatchers and heard their distinctive call from the top of trees. Lots of baby birds! Other species we found were: Mallard, Turkey Vulture, Killdeer, Mourning Dove, Rock Pigeon, Chimney Swift, Downy Woodpecker, Northern Flicker, Eastern Phoebe, Eastern Kingbird, Blue Jay, American Crow, N. Rough-winged Swallow, Tree Swallow, Barn Swallow, Tufted Titmouse, Carolina Chickadee, Carolina Wren, Blue-gray Gnatcatcher, Eastern Bluebird, American Robin, Gray Catbird, Northern Mockingbird, Brown Thrasher, European Starling, Cedar Waxwing, Northern Parula, Yellow-throated Warbler, Black and White Warbler, Common Yellowthroat, Northern Cardinal, Indigo Bunting, Eastern Towhee, Song Sparrow, Red-winged Blackbird, Common Grackle, House Finch, and American Goldfinch for a total of 44 species for the morning. Good work everyone! Come join us to try this section again on Karen’s next walk on July 10th. We’ll try again to find the Yellow Warbler and more. Our walk on June 19, 2013 was beautiful–there were only 3 of us (Mike, Rita, and myself) but we were able to identify 42 species. One of my favorite finds began when Rita saw 2 little birds on a bare branch which led to seeing a parent bird fly by to another branch–and then we saw 3 more little ones. They were 5 barn swallow babies!!! I wished again that I had a camera!!! These swallows were just past the road bridge on the way to the Tassee Shelter–the same bridge that has the Cliff Swallow nests. The other 41 species were: Canada Geese, Turkey Vultures, Red-shouldered Hawk, Killdeer(in flight), Mourning Doves, Rock Pigeons, Chimney Swifts, Ruby-throated Hummingbird, Red-bellied and Downy and Pileated Wdps., E.Phoebes, White-eyed Vireos, Blue Jays, Am.Crows, Fish Crows, N.Rough-winged Swallows, Tree swallows, Barn Swallows, Tufted Titmice, Carolina Chickadees, White-breasted Nuthatches, Carolina Wrens, House Wren, E.Bluebirds, Am.Robins, Gray Catbirds, N.Mockingbirds, Brown Thrashers, Eur.Starlings, N.Parulas, Common Yellowthroats, Yellow-breasted Chats, N.Cardinals, Indigo Buntings, E.Towhees, Field Sparrows, Song Sparrows, Brown-headed Cowbirds, Orchard Orioles, House Finches, and Am.Goldfinches. 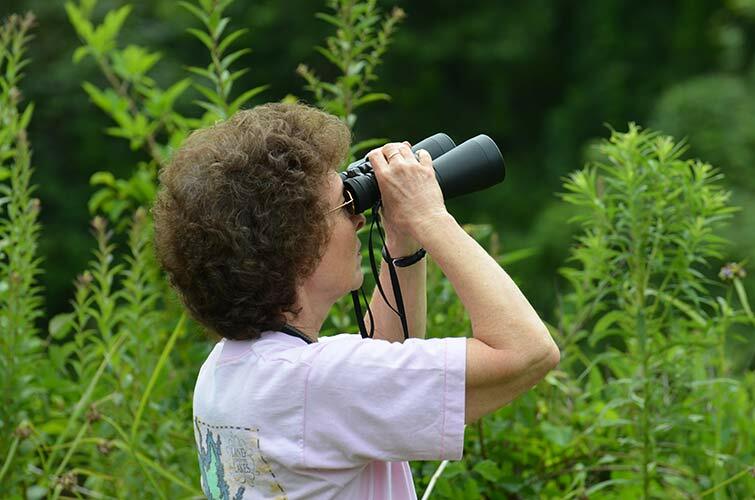 Hope you will join us next Wed for Karen’s walk–and don’t forget to come on Saturday, June 29, to join the Highlands Audubon Society enjoy a bird walk at the LIbrary section of the Greenway! We started at Suli Marsh with Pat, Mike, Dona and Janice, Ellen and Jim joining me for a nice cool morning walk on this section. We enjoyed the change and heard/saw some new ones for us enjoying great viewings of the pair of Orchard Orioles in the Sycamore trees and hearing the Yellow-billed Cuckoo. Others were: Wood Duck, Mallard, Mourning Dove, Chimney Swift, Ruby-throated Hummingbird, Red-bellied Woodpecker, Downy WP, Northern Flicker, Pileated WP, White-eyed Vireo, Blue Jay, American Crow, Northern Rough-winged Swallow, Tufted Titmouse, Carolina Chickadee, Carolina Wren, Blue-gray Gnatcatcher, Eastern Bluebird, American Robin, Wood Thrush, Northern Mockingbird, Brown Thrasher, Cedar Waxwing, Common Yellowthroat, Yellow-breasted Chat (great views), Northern Cardinal, Indigo Bunting, Eastern Towhee, Song Sparrow, Red-winged Blackbird, Common Grackle, American Goldfinch, Turkey Vulture, and Cooper’s Hawk, making a total of 36 species. Stay tuned for the decision on where our walk with take place on June 26th as we discussed doing a different section of the Greenway. On Wed., June 5, NINE birders (Jean, Mike, Jim, Ellen, Ned, Pat, Rita, Diane, and myself) ventured forth from Salali Lane on our weekly bird walk–and together we saw/heard 46 species. It was such a gorgeous morning to be out on the Greenway, and these are the birds we found there: Green Heron(in flight), Canada Geese, Turkey Vulture, Black Vulture, Cooper’s Hawk (carrying his newly caught breakfast), Broad-winged Hawk, Mourning Doves, Rock Pigeons, Chimney Swifts, Ruby-throated Hummingbird, Belted Kingfishers, Red-bellied and Downy Wdps., N.Flickers, Pileated Wdp., E.Phoebes, Great-crested Flycatcher, Blue Jays, Am.Crows, Fish Crows, N.Rough-winged Swallows, Tree Swallows, Barn Swallows, Cliff Swallows, Tufted Titmice, C.Chickadees, White-breasted Nuthatches, Carolina Wrens, Blue-gray Gnatcatchers, E.Bluebirds, Am.Robins, Gray Catbird, N.Mockingbirds, Eur.Starlings, N.Parulas, Common Yellowthroat, Yellow-breasted Chats, N.Cardinals, Indigo Buntings, E.Towhees, Field Sparrows, Song Sparrows, Brown-headed Cowbirds, Common Grackles, House Finches, and Am.Goldfinches. Thanks to all who came–and don’t forget to meet with Karen next Wed. at the SULI MARSH. Thanks to Mike, Jean, Jim, Ellen, Pat, and myself we had a pleasant morning of birding starting in the woods to hear and learn the Hooded Warbler song. Thanks to Jim and Ellen for helping us with that. We also were treated to a nice view of a Great Blue Heron flying over the field spotted by Mike. Jim saw our only raptor finding a Cooper’s Hawk soaring in the sky. Other species seen or heard were: Turkey Vulture, Mourning Dove, Red-bellied Woodpecker, Northern Flicker, Pileated WP, Eastern Wood-pewee, Blue Jay, American Crow, N. Rough-winged Swallow, Chimney Swift, Tufted Titmouse, Carolina Chickadee, White-breasted Nuthatch, Carolina Wren, Blue-gray Gnatcatcher, Eastern Bluebird, American Robin, Northern Mockingbird, Cedar Waxwings, Yellow-breasted Chat, Northern Cardinal, Indigo bunting, Blue Grosbeak, Eastern Towhee, Field Sparrow, Chipping Sparrow, Song Sparrow, Brown-headed Cowbird, Red-winged Blackbird, House Finch, and American Goldfinch, for a total of 33 species. We were serenaded by a Mockingbird giving calls of Chats, Carolina Wrens, Red-shouldered Hawk, Cardinal, and Red-tailed Hawk. Baby Bluebirds were being fed. We are going to check out the Suli Marsh area on my next birding Wednesday which will be June 12th at 8:00 am. Let’s join Paula June 5th at Salalie Lane at 8:00 am for another great day of birding. We had a beautiful walk on Wed., May 22, starting at Salali Lane. I was joined by 6 others–Jean, Ned, Mike, Diane, Jim and Ellen–and we saw/heard 51 species. My favorites were a Phoebe with 4 littles ones who were learning to perch and way their tails, as well as a Peregrine Falcon flying over–Yes, we deliberated a lot on that one! But from the shape of the wings and its size that was our conclusion. The other species were the following: Canada Geese, Turkey and Black Vultures, Red-shouldered Hawk, Mourning Doves, Rock Pigeons, Chimney Swifts, Ruby-throated Hummingbird, Red-bellied, Downy, and Pileated Wdps., N. Flicker, Great-crested Flycatcher, E.Kingbird, Red-eyed and White-eyed Vireos, Blue Jays, Am.Crows, Fish Crow, Swallows: N.Rough-winged, Tree, Barn & Cliff, Tufted Titmice, Carolina Chickadees, White-breasted Nuthatch, Carolina Wrens, Blue-gray Gnatcatchers, E,Bluebirds, Am.Robins, Wood Thrush, Gray Catbird, N.Mockingbird, Brown Thrasher, Eur.Starlings, Cedar Waxwings, N.Parulas, Common Yellowthroats, Yellow-breasted Chat, N.Cardinals, Indigo Buntings, E. Towhees, Field Sparrow, Song Sparrows, Brown-headed Cowbirds, Common Grackles, Orchard Orioles, House Finches, and Am.Goldfinches. Join Karen next Wednesday at the Library for more surprises along the Greenway!!! Twelve showed up for a beautiful morning of birding today. We had a sort of lull in bird activity especially after the last two reports, but worked hard and came up with 42 species. They were: Canada Geese, Turkey Vulture, Red-tailed Hawk, Mourning Dove, Rock Pigeon,Chimney Swift, Red-bellied Woodpecker, Downy WP, Pileated WP, Eastern Kingbird, Red-eyed Vireo, Blue Jay, American Crow, N. Rough-winged Swallow, Barn Swallow, Tufted Titmouse, Carolina Chickadee, White-breasted Nuthatch, Carolina Wren, Blue-gray Gnatcatcher, Eastern Bluebird, American Robin, Wood Thrush, Gray Catbird, Northern Mockingbird, Brown Thrasher, European Starling, Cedar Waxwing, Northern Parula Warbler, Chestnut-sided Warbler, Palm Warbler, American Redstart, Yellow-breasted Chat, Northern Cardinal, Indigo Bunting, Eastern Towhee, Field Sparrow, Song Sparrow, Brown-headed Cowbird, Red-winged Blackbird, Orchard Oriole, and American Goldfinch. Let’s join Paula next Wednesday at Salalie for another wonderful day of birding. Thanks to Jean, Ned, Ellen, Jim, Mike, David, Richard, Rita, and Karen we found 51 species this morning!! What a great morning of birding. Again we saw the Scarlet Tanager and the Blue Grosbeak and this time Orchard Orioles. Exciting to see the Yellow-breasted Chat has returned. Here’s the list: Canada Geese, Turkey Vulture, Black Vulture, Red-shouldered Hawk (two, one with prey), Spotted Sandpiper (finally, on the section), Mourning Dove, Rock Pigeon, Chimney Swift, Belted Kingfisher, REd-bellied Woodpecker, Downy WP, Pileated WP, Eastern Phoebe, Eastern Kingbird (a pair), White-eyed Vireo, Blue Jay, American Crow, N. Rough-winged Swallow, Tree Swallow, Tufted Titmouse, Carolina Chickadee, White-breasted Nuthatch, Carolina Wren, Blue-gray Gnatcatcher, Eastern Bluebird, American Robin, Wood Thrush, Gray Catbird, Northern Mockingbird, Brown Thrasher, European Starling, Northern Parula, Cape May Warbler, Yellow-rumped Warbler, Palm Warbler, Yellow-breasted Chat, Scarlet Tanager, Northern Cardinal, Rose-breasted Grosbeak, Indigo bunting, Blue Grosbeak, Eastern Towhee, Field Sparrow, White-throated Sparrow, Song Sparrow, Brown-headed Cowbird, Red-winged Blackbird, Orchard Oriole, House Finch, and, American Goldfinch. Let’s join Paula next Wednesday for another exciting morning of birding at Salalie. We have had such a wonderful start to our walks and this last Wed. at Salali was fabulous as well! There were 9 of us altogether and we identified 44 species. The expert eyes belonged to Jean, Pat, Rita, Jim, Ellen, Ned, Verna, and David. The most unusual sightings were a Marsh Wren and an Orange-crowned Warbler and I was also glad to see that the White-crowned Sparrows have not left yet. The others were the following: Canada Geese (6 little ones as well), Mallard Duck, Broad-winged Hawks, Killdeer, Mourning Doves, Rock Pigeons, Belted Kingfisher, Red-bellied and Downy Wdp., N. Flickers, E. Phoebe, E. Kingbirds, White-eyed Vireo, Blue Jays, Am. Crows, N.Rough-winged Swallows, Tree Swallows, Barn Swallow, Cliff Swallows, Tufted Titmice, Carolina Chickadees, Carolina Wrens, House Wren, Blue-gray Gnatcatchers, E.Bluebirds, Am. Robins, Wood Thrushes, N.Mockinbgbirds, Brown Thrasher, Yellow Warbler, Yellow-rumped Warbler, Yellow-throated Warbler, N.Cardinals, Indigo Buntings, E.Towhees, Field Sparrows, White-throated Sparrows, Song Sparrows, Brown-headed Cowbirds, House FInches, and Am.Goldfinches. Hope you will all return next week at the Library for another GREAT BIRDING ADVENTURE!!!!!!!!!! Another great bird walk from the library area of the Greenway. 12 showed up to help find birds, and having many eyes and ears really brought up our total for the morning…43 species! Thanks to David, Ned, Patty, Jim, Ellen, Mike, Jean, Don, Richard, Lee, Rita and myself. Weather was great and here’s the list: Canada Geese, Turkey Vulture, Black Vulture, Mourning Dove, Rock Pigeon, Chimney Swift, Red-bellied Woodpecker, Downy WP, Eastern Phoebe, Eastern Kingbird, White-eyed Vireo, Blue-headed Vireo, Blue Jan, American Crow, N. Rough-winged Swallow, Tree Swallow, Tufted Titmouse, Carolina Chicadee, White-breasted Nuthatch, Carolina Wren, Ruby-crowned Kinglet, Blue-gray Gnatcatcher, Eastern Bluebird, American Robin, Northern Mockingbird, Brown Thrasher, European Starling, Northern Parula, Yellow-rumped Warbler, Palm Warblers, Yellow-throated Warbler, SCARLET TANAGER, Northern Cardinal, BLUE GROSBEAK, Eastern Towhee, Field Sparrow, Chipping Sparrow, Savannah Sparrow, White-throated Sparrow, Song Sparrow, Brown-headed Cowbird, Red-winged blackbird, and American Goldfinch. Fantastic to see so many and more will be showing up so rise early and join us. We are having a blast! It was great being out on the Greenway again with so many pairs of eyes to help spot so many beautiful birds!!! Thanks to Jean, Pat, Rita, Mike, Ned, David, Jim and Ellen we were able to identify officially 41 species but I think it was really 42–I remember Jim mentioning a N. Rough-winged Swallow but I hadn’t marked it down and that may have been the #42. These were the others: Canada Geese, Mallards, Turkey Vultures, Red-shouldered Hawk, Killdeer in flight, Spotted Sandpiper, Mourning Doves, Rock Pigeons, Red-bellied Wdps., Downy Wdps., Hairy Wdp., N.Flicker, Pileated Wdp., E.Phoebe, White-eyed Vireo, Blue Jays, Am.Crows, Tree Swallows, Cliff Swallows, Tufted Titmice, Carolina Chickadees, White-breasted Nuthatch, Carolina Wrens, Blue-gray Gnatcatcher, E,Bluebirds, Am.Robins, N.Mockingbirds, Brown Thrashers, Eur.Starlings, Yellow-rumped Warblers, N.Cardinals, E.Towhees, Field Sparrows, Chipping Sparrow, White-throated Sparrow, Song Sparrows, White-crowned Sparrows (I have seen these since Feb. near the Tassee Shelter), Brown-headed Cowbirds, Red-winged Blackbirds, House Finches, and Am.Goldfinches. Hope you will come next Wed. with Karen for more birding near the Library! Welcome back to our Bird walks on the Greenway!!! We had our first walk of this year April 3, Wednesday at the library location. Nine people showed up to follow the birds of spring. We welcome two new members who joined us, Pat and Ned. Great to have Jim and Ellen back also, who helped us with the many sparrows. Eastern Bluebird, American Robins, Northern Mockingbird, Brown Thrasher, European Starling, Cedar Waxwings, Northern Cardinal, Eastern Towhee, Field Sparrow, Chipping Sparrow, Savannah Sparrow, White-throated Sparrow, Song Sparrow, Swamp Sparrow, and a new one…Vesper Sparrow, Eastern Meadowlark, Brown-headed Cowbird, and House finch for a total of 30 species. Paula will lead our next walk at Salalie Lane next Wednesday. We are seeing migrants and will begin seeing more so come out and join us and enjoy these great sightings. Thanks Stan and Mary for posting your sighting. I walked the Greenway on Sunday as well but started from Salali Lane and continued past the Tassee Shelter to the Library area. I noticed the Tree Swallows circling the bluebird house where they nested last year–however, a bluebird was there as well for a little competition. I also heard the Fish Crow for the first time in months. Last Friday I was on the Greenway near the Library and followed a warbler which fortunately perched on a high branch in good light against the blue sky–it was a Cape May warbler. As it turned its head the orange patches on the side of the face were very clear. There were also Yellow-rumps there as well. This is Stan and Mary Polanski, posting here for the first time. Today, Sunday, March 10, 2013, we did a break-of-dawn walk along mile 1 of the Greenway. Got good long looks at a pair of hooded mergansers. A small flock of yellow-rumped warblers were feeding at the beaver pond near the playground. Don’t wait for our first walk on April 3 to go birding on the Greenway. I’m always surprised to find something new–last Sunday there were 3 White-crowned Sparrows under bushes near the Tassee Shelter. Let us know what you are seeing along the Greenway!